I am still sore! I admit that I feel more like a whimpy sucker than a tough sucker... I think the months in Arizona made me soft. (tan, but soft). 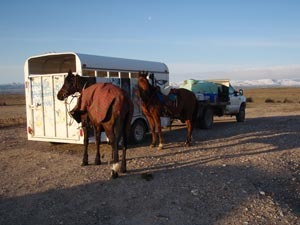 We did manage to brace ourselves against the howling pre-dawn wind, and got ourselves coffeed and dressed and caught the horses so we could saddle them and blanket them and drive the 15 miles to base camp for the Owyhee Tough Sucker ride. And since our good and punctual friend Carol whimped out at the last minute (the cold wind really was howling, and it snowed during the night, and it was downright nasty) this meant we had more flexibility about leaving (punctuality has never been one of my problems) and I decided to spend the first daylight putting Jaziret's boots on here at home instead of after we got to the ride. But - it was not a perfect feet day for Jaziret. Tender feet from the cold/wet/muddy paddock the horses were in for 5 days, and while the gloves never bothered him before, they seemed to during this ride. We still did ok, but he didn't have the blazing effortless gait that I'd felt during the last 3 rides. 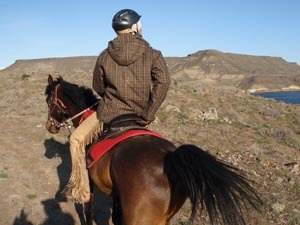 He's ok now - we turned all the horses out together in the big 'pasture' and he's galloping around looking pretty good. His next ride is in a month - hopefully his feet will have toughened up again. I may use the gloves again - we'll see! They certainly stayed on beautifully, no obvious rubs anywhere, no problems that I could see. Fun ride, and great to see all the locals and friends again. And - I brought Krusty home after the ride! Nature's Kruschev, 20 yrs old now, 16hh black Orlov Trotter/ Arabian cross, 3300 miles, 14 years of rides, 66 starts, 64 completions. 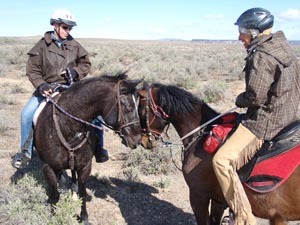 Trusty Krusty the horse that everybody loves to ride, he took me to a Pan American Championship in Canada, a World Championship in France, and a World Cup in Dubai, on the Outlaw Trail, the Renegade trail, Bryce Canyon, Lost Wagon Train, miles and miles of pleasure. A horse I could ride 100 miles and feel like I'd done nothing. Big, beautiful black horse. I gave him to a young girl, Isabelle, three years ago when she started doing endurance with her dad Bruce Worman. Since then Bruce and Nance have had him and learned to love him too. Nance and I were talking about horses and how they teach us life's lessons - she said "Yes, Krusty's motto for life is eat lots, stay cool, and don't get upset about anything:) " . A good lesson for living! Isabelle isn't doing endurance now, and I really miss the big hoss, so I asked Nance and Bruce if I could take him back and they sadly agreed. Bruce rode him on the LD at the Tough Sucker ride (top ten!) and we met up on the trail. He and Jaziret recognized each other right away. The favorite horses. So now it's Monday afternoon, I've been packing (and procrastinating) all day, and tomorrow I fly to Spain for the 5th running of Tierras de Al Andalus, or Tierras de Andalucía. The 600km ride across the breadth of Andalucía. I had the good fortune to ride it two years ago, last year Merri went to Spain and I went to Malaysia, and three years ago we sent Lynne Glazier to cover it. (). Three years of photos and stories and this year's ride coverage at http://www.endurance.net/international/Spain/2010AlAndalus/This year I'm going again - not to ride though, just to take photos and write the story and drink the wine and eat the food and see all my Spanish friends again... and live the adventure.